From the developer of Salt and Sanctuary. Inextricably linked with the Xbox Live Arcade chapter of indie gaming history, a couple of Ska Studios' early games unexpectedly hit PC yesterday. And boy, what a nostalgia trip. 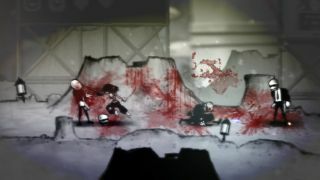 They were never my thing, but even seeing screenshots of the grungy and gory The Dishwasher: Vampire Smile, and the slightly less grungy but equally gory Charlie Murder takes me right back to the early 2010s. Fan favourites back in the days of XBLA, both games have inexplicably been unavailable on PC until now, but you can now grab them individually (here's Charlie Murder, and here's The Dishwasher sequel Vampire Smile), or as part of Ska Studios' wincingly named The Skallection on Steam. Charlie Murder is a co-op brawler set in the punk rock apocalypse, while Vampire Smile is a "combo-fueled, fast-paced, stylistic 2D action platformer", and a sequel to The Dishwasher, which hasn't been ported to PC. They'll set you back £6.99/$9.99 apiece—although there's a 15% saving if you buy the 'Skallection'—and I'll stick trailers to both games below.